Swarovski crystals add power & beauty. from greeting card size to mural size. They are a powerful bridge to healing. Many of Agnes’ clients have spoken of the healing power of her art. They have told her their stories how her art has helped them to heal from illness, trauma and life challenging situations. Ever since ancient times, a strong belief has existed that art heals the spirit. Today, medical science along with healing art nonprofit organizations is proving the reality of that belief. By focusing our attention and intention on healing spiritual art, we enable ourselves to experience the transformative power of healing art. Agnes created the Healing Gateway as a way to provide a powerful bridge to healing, inspiration, empowerment, creativity and transformation. Each original Healing Gateway is custom designed and specially made for your healing needs. Gateways are openings or passage ways that lead us to an expanded view of our Selves, and the world around us. Passing through the threshold of a gateway, we enter new beginnings and leave the past behind. We transition into a new awareness of different parts of our Selves that remained hidden before. We encounter powerful messages that inspire and empower us. Healing Gateways facilitate our healing into the beauty and bountiful garden of our spirit of universal love where hidden realities become visible. or Open Door" into the healing power of her art. If your organization uses healing art and healing art programs to help individuals, their communities, and society at large, then please contact Agnes to help with your mission. She is most interested in providing the healing power of art to hospitals and wellness facilities, transforming otherwise sterile public and patient areas into inspiring environments that encourage a sense of well-being and serenity and hope for patients, their visitors and families, and for healthcare providers. You can envision your original “one-of-a-kind-you-nique” custom Gateway for healing, inspiration, empowerment, meditation, transformation, a combination of all these elements, or a design that is exceptionally you. Each of Agnes’ exclusive personally designed Healing Gateways is distinctively handcrafted with an array of pastel and deeper vibrant colors. A variety of mixed media can be selected to beautify the elegance of the Gateway – feathers, glitter, rhinestones, Swarovski crystals, and sequins in dazzling pinks, shimmering golds and electric blues. 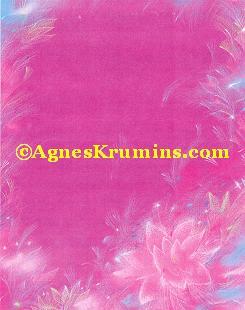 Agnes uses Swarovski crystals exclusively to decorate her handcrafted greeting cards and Healing Gateways. Swarovski crystals are known throughout the world as the best crystal-based ornaments that make exceptional gifts. The company was founded over 120 years ago in Austria. The 2009 documentary film "This Is It" shows Michael Jackson rehearsing for a concert tour, featuring costumes covered in Swarovski crystals. Please use "contact the artist" form to submit your order. Be sure to include your telephone number. 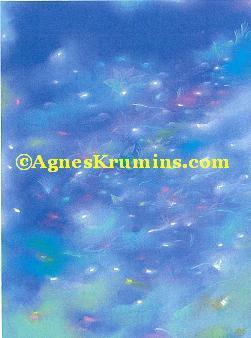 Using her intuitive abilities, Agnes will discuss your Gateway with you and together you will create your vision. Custom Gateways can be any size, and designed to be affordable.